Book Lovers Life: Ultimate Sacrifice by S.E. Green Blog Tour and Giveaway! Ultimate Sacrifice by S.E. Green Blog Tour and Giveaway! When Vickie's brother comes running out of the woods after discovering the dead body of a child in the woods, little does Vickie know that her ordinary, quiet life is about to become anything but! Her life is going to change forever after secrets and lies become exposed. This was awesome!! I wasn't sure what to expect but what I got was a seriously twisty and twisted read. The plot was slow to start but once it got going, it was a murder/mystery with Satanic elements. I honestly didn't know who to even suspect because there was so many suspects to choose from!! There are a lot of extra things going on as well as the murder. It just goes to show that you never truly know anyone, not even family. The characters were all well written and developed. I really liked Vickie. She is trying to get to the bottom of the murder because she used to babysit that little girl, and thinks that someone is trying to frame their family since some of the clues are planted near their place. The police don't even seem to have a suspect but Vickie is intent on helping them. Lies after lies are exposed and Vickie finds out some truly surprising things. In all, a great mystery that was entertaining and addicting. There were a few unanswered questions but overall I was satisfied with how it ended. Thoroughly enjoyed and now I need to check out more from this author. S. E. Green (aka Shannon Greenland) is the award winning author of the thriller, KILLER INSTINCT, the spy series, THE SPECIALISTS, and the romances, THE SUMMER MY LIFE BEGAN and SHADOW OF A GIRL. She lives off the coast of Florida with her very grouchy dog. 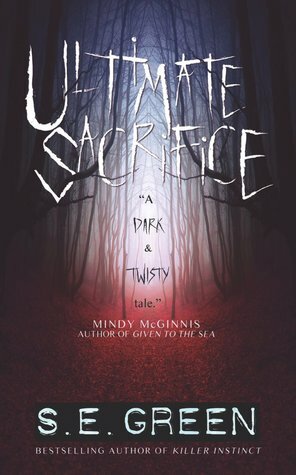 ULTIMATE SACRIFICE is her debut YA horror, due out October 2017.